Forest Vista 5th graders have been learning about the SUN, EARTH, and MOON in their 5th grade science classes. In language arts, students worked in collaborative groups to design PODCAST SEGMENTS around the same central theme of "Sun, Earth, and Moon" to both enhance and extend their learning. Each class was split into 6 research/design groups. Each group was assigned a topic as well as a segment theme to use as a starting point. Two podcast "hosts" were also appointed in each homeroom. The hosts were tasked with writing both the opening and closing of each full podcast. They also provided entertaining segues between the segments. One class member described the hosts as the "glue holding the podcast together!" Students used class textbook materials (such as StemScopes) to strengthen what they previously learned in science. Students extended their learning by conducting further research about their segment topic. Collaboratively, each group synthesized their knowledge by writing scripts in a shared Google Doc. Their challenge was to create an engaging and informative script using a conversational style of delivery. Students performed their scripts prior to recording, and using both teacher/peer feedback as they revised their writing to sharpen the overall production. Thanks to an L.E.F. (Lewisville Education Foundation) grant, the 5th graders recorded their segments using Blue Yeti Microphones. They edited their recordings using GARAGEBAND on MacBook Airs. Sound effects were inserted to add interest and overall entertainment value to the work. Finally, soundtracks (using royalty-free music recordings) were selected by the children to add both feeling and atmosphere to their segments . Some student groups even designed their OWN music soundtrack "works of art" in GarageBand as part of their group's workflow. Each 5th grade class's complete PODCAST is linked below. Their hard work and dedication to this project is evident. Students experienced a high-level of engagement as they transformed their learning into student-created products that are now published for the world to enjoy. The final phase of the workflow focused both PEER and SELF evaluations. Each student looked critically at their own contributions to the final product. They reflected on their strengths and challenges as learners and as members of a research/design team. They also assessed the contributions of their peers. 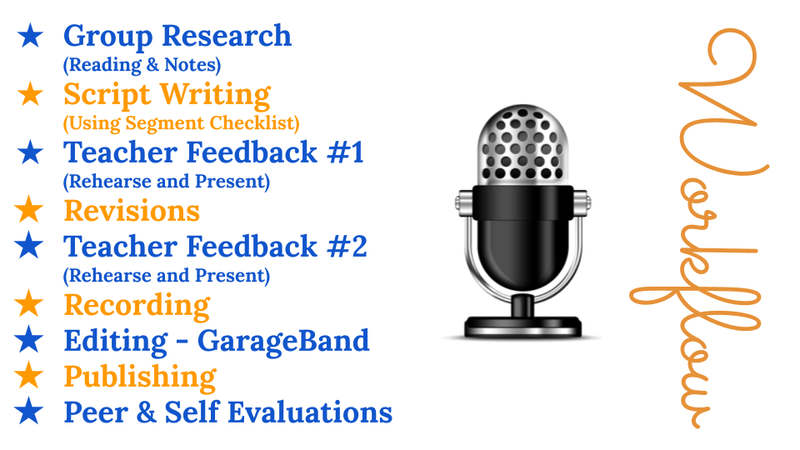 Podcasting embodies the interconnected nature of listening, speaking, reading, writing, and thinking through inquiry and research. Hard Work + Organization + Creativity + Student Engagement = REMARKABLE WORK!